Across 2017 and 2018 we have been working with award winning Bristol based artist, Kathy Hinde, on a new commission. 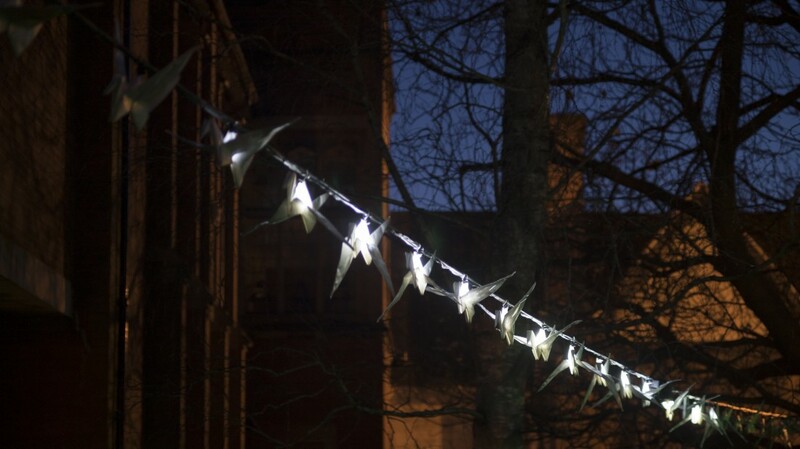 Kathy has developed ideas through public workshops, talks, walks and residencies working towards the creation of a sound, light and text artwork for public space concerned with how birds adapt to survive in response to environmental change. Chirp&Drift aims to highlight processes where errors and miscommunications occur, as a metaphor for broken ecologies such as interruptions to habitats, narrowing sonic bandwidths for bird-calls to be heard clearly, elongated migration routes, changes in water levels and the implications all these factors have on bird-life. The commission will culminate in a playful new work in the Storey Gardens at Light Up Lancaster 2018. See Chirp&Drift for full info. For Chirp&Drift, Kathy has invited a team of artists, researchers and technologists to take part in research and development over the summer and autumn 2018. A time to experiment, to discover, to have conversations, to share and develop ideas together. Know West Media Centre The Factory – Hosting residency, Bristol. The first event, on May 27th, was a participatory walk and workshop at the stunning RSPB reserve Leighton Moss with expert guidance from conservationist and writer Laurence Rose. and a writing, sound and visual workshop led by Sarah Hymas and Kathy Hinde.